This morning it was announced that the 10th anniversary edition of Twilight would include a genderbent version called Life and Death, in which Bella is now Beau, and Edward is now Edythe. As you can probably imagine, a lot of the Internet response has been pretty disdainful, as most discourse has been regarding anything having to do with the series, including Kristen Stewart and Robert Pattinson, who have since moved on with their lives to do other awesome film projects. I'm not going to lie - I can be snarky about Twilight sometimes too. It's very easy to do so - there are a lot of problematic elements within the book series itself, and then add to it the fandom fervor, the gossip headlines, etc., and it's a perfect storm of mockable elements ripe for the picking. There has been a lot written and said about what is bad about Twilight. So I'm going to talk about what I like about it instead. At the time that I first read Twilight, which was well after the third book Eclipse had already come out (but before the movie was cast), I had recently finished grad school and started my current job teaching high school English. It was something I'd seen kids carrying around, and whenever I was at Border's (RIP), it was always a featured title. I don't know what made me pick it up - I think the description was appealing to me because I was a big LJ Smith fan when I was in high school. (She's the original author of The Vampire Diaries, before the tv show and before the publishers took over the series.) I hadn't spent much time reading YA at all since I had graduated high school six years before (snobby English major! ), but there was something about being in a high school environment again that made me slightly nostalgic for my own teen years, and suddenly, here was a book series that was right up Teen Thu's alley. I devoured it. I loved it. I got swept up in the FEELS, to use fandom parlance. That's something that I still to this day will credit Twilight for - Meyer (and also Melissa Rosenberg, who wrote the movie screenplays) really knows how to bring on the romance and drama. For the amount of time I spent reading those books, it was a great escape. And while many people will claim Meyer's reader-by-proxy style of writing Bella as a criticism, I think that it can be fun and enjoyable. Again, I consider Twilight to be a PG-13 romance novel, and I think in that sense, it succeeds. There are a lot of people who are willing to hate something just because it is popular, regardless of problematic elements, but you cannot deny that it sparked some sort of a YA renaissance, especially for teen girls. (Sure, there was Harry Potter before it, but HP kind of exists on a different plane from basically anything else.) It is especially important to consider the fact that it is a book featuring a female protagonist, written by a female author, adapted by a female screenwriter, and (at least at first) the movie was directed by a female director. That's a big deal. And I'm not going to say that there wouldn't have been Katniss, Tris, Clary, Hazel Grace, or whatever... but I think that the success of Twilight as a marketing machine made other media outlets, investors, whatever, etc, sit up and pay attention and possibly be more receptive to other new authors. And I know that people will chime in that just because something is popular, it doesn't mean it's good. Yeah, I know. I'm not here to argue that you personally need to think that the series itself is good or well-written. That's subjective. Instead, what I'd like to contend is that its impact has been far-reaching and good overall. All that stuff about abusive, stalkery relationships? We're having those conversations now, with teens! All that stuff about underlying race issues (regarding the "pale faces" and the NA werewolves)? We're having those conversations too. All that stuff about what it means to be a strong female character that teen girls can look up to? We're definitely having lots of those conversations. I personally am having these conversations because I am in a position to reach lots of teenagers and to help guide them in their media consumption. So, yeah. I still love this series. I have no problem snarking at it, but in truth, I love it. I love it for its escapist fantasy, I love it for the discussions it engenders, and I love it for the door that it opened, letting in tons of other amazing YA writers with it. 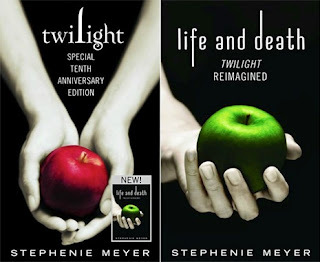 My life is profoundly different because I read Twilight, and I feel no shame about that. I read Life and Death around the time of a break up and it reminded me how quickly Bella and Edward became caught up in each other except it had the character reversal situation. It was just a reminder for me. Anyway, when I read it I was like damn, I thought moved quickly yrs ago, but this was exactly how my boo and I acted! Except our situation ended like the zombie apocalypse than Twilight. Anyway, I really like the Life and Death version for being less emotional. I don't know why because I love emotions written out in wonderful books! Not in real life, though Lol.